This analysis article, by CESR's Mahinour el-Badrawi and Allison Corkery was published by the Bretton Woods Project in February 2017. A pdf version can be downloaded here. In November 2016, the executive board of the IMF approved an agreement with the government of Egypt for a three year $12-billion loan. The new agreement is made under the IMF’s Extended Fund Facility, which supports long-term “structural adjustment”. The IMF is also reportedly working with the government of Egypt to secure an additional $5-6 billion in bilateral funding, including from China and Saudi Arabia. Intended to remedy the country’s economic woes, the agreement pushes classic austerity-based policies in Egypt, which will aggravate poverty and inequality on a large scale. Contrary to the IMF’s transparency guidelines, the Staff Report, outlining the policies underpinning the IMF arrangement under the Extended Fund Facility, was not publically released until January 18, 2017. The formal loan agreement, its conditions, and related documents have not been made public to date, over two months after an agreement was reached with the government, which is contrary to the IMF’s transparency guidelines. Nevertheless, the press release announcing the loan’s approval explained that the aim of the extended fund facility programme with Egypt is to restore stability and confidence in the economy. To do this, the programme supports the “government’s home-grown comprehensive economic reform plan”. This plan includes a range of monetary and fiscal reforms that first seek to reduce public spending, including by reforming the civil service and by reducing the public sector’s role in the provision of subsidised social services. The second aim of these reforms is to increase state revenue, including by introducing a value-added tax (VAT) and by liberalizing the exchange rate to shore up the country’s foreign reserves and encourage foreign investment. So far, reforms have resulted in an unprecedented rise in inflation. The official inflation rate stood at 24.3 per cent in December 2016; the worst economic deterioration since 2013. This has huge consequences for the cost of living in the country, given its heavy reliance on imports. The burden of higher living costs will fall most heavily on the poor and is likely to exacerbate already widespread deprivations of economic and social rights in the country. In a country where over half of the youth population lives below the national poverty line and over a quarter are unemployed, the cumulative effect of these reforms is already starting to have a devastating impact on the standard of living of millions of Egyptians. Unsurprisingly, there have been mass mobilizations against the IMF loan since it was first proposed in 2012. Social movements, non-governmental organizations, political parties and public interest lawyers have all stood in opposition to it. Protests against the loan and its accompanying reforms continue, including, most recently, protests by the Union of Tax Workers and the Lawyers Syndicate on the socio-economic impacts of the VAT. Despite opposition, the government has pushed through a raft of measures this year, triggered by its aspiration to secure the loan from the IMF. In an attempt to decrease the public sector wage bill, the highly controversial Law 18 of 2015 was approved by parliament in August 2016, after being enacted by Presidential Decree in 2015. The law grants the state the power to terminate any employee’s contract within a six-month probation period, with no more than a “notice”. After six months, an employee may be relocated, subjected to a salary reduction of 50 per cent, or terminated after two consecutive weak performance reviews. This downsizing – praised by the IMF in 2015 – puts millions of state workers at risk of mass layoffs and disproportionately disadvantages women, who will be forced to compete in a discriminatory unregulated private sector where they earn 35-40 per cent less than their male counterparts. Law 18 of 2015 also reduces annual salary increases in the public sector from 10 to 7 per cent. This leaves the average Egyptian with less to spend as the cost of living soars. Another measure being pursued to reduce public spending is to dismantle various subsidy systems in the country. In November 2016, the government announced a hike in the price of subsidised fuel of between 30 and 46.8 per cent, with a huge knock-on effect for a wide range of food and transport costs. In January 2017, the price of medicine was raised another 15 – 20 per cent after the cost of production increased by 100 per cent. It had already been raised 20 per cent in May 2016 and the government’s latest proposal is for an automatic increase every six months. This affects the overall availability and affordability of medications. The increase in overall import costs are also affecting access to subsidised infant milk, leading Egyptian parents to take to the streets in protest. Revenue raising efforts are equally problematic. For example, the Central Bank floated the Egyptian pound in early November, right before the loan was approved, after devaluing it from 8.8 to 13 pounds to the US dollar earlier in the same week. The exchange rate today stands at 18.69 pounds to the US dollar. This affects the government’s debt servicing bills, which is paid in dollars. According to the Central Bank of Egypt, foreign debt servicing increased to 18.1 per cent in the last quarter of financial year (FY) 2015/16. It is expected to reach 19 per cent ($62.1bn) in FY 2016/2017 and 21.8 per cent by 2020. This directly affects economic and social rights, as debt servicing ties up resources that could otherwise be used for fulfilling the government’s constitutional obligations to progressively increase spending on health and education, which it has so far failed to honour. VAT legislation, approved in late August, introduced a 13 per cent VAT for the current financial year – replacing the previous 10 per cent sales tax – which will be raised to 14 per cent next year. Although some basic food products have reportedly been exempt from VAT, this directly affects the cost of living and impacts poorer households disproportionately. The cumulative impact of rushed and ad hoc cuts in public spending, subsidy removal, currency devaluation, and regressive VAT increases, will be spiraling inflation, higher import costs, rising living costs, wage stagnation, increased unemployment, poverty, and inequality with predictably dire consequences for economic and social rights. Indeed, the impacts of a weaker pound and higher inflation are already being felt. Food and beverage prices were 29.3 per cent higher in December 2016 than the year before. Again, this impacts poorer households disproportionately. Coupled with restrictions on imports, Egyptians are experiencing unprecedented shortages in essential items. There has already been a severe crisis in the price and availability of medication, as well as a deterioration in healthcare services caused by shortages in medical supplies. This is particularly problematic as it plays against the stated commitments the government of Egypt sets for itself as it attempts to champion the developing nations’ implimentation of the Sustainable Development Goals during the 2016 High-Level Political Forum voluntary review. According to the IMF, social protection is a “cornerstone” of the government’s programme and will help to cushion the impact of the above measures. However, details of how budgetary savings will translate into an improved social safety net remain extremely scant in the IMF staff report and experience to date raises a number of red flags. Targeted social protection measures have been implemented through a World Bank technical assistance loan programme since April 2015, including ration cards for fuel and food and the introduction of two conditional cash transfer programmes; the World Bank has warned of a “substantial risk” to the success of these programmes, however. There are indeed a number of serious concerns regarding these social protection measures. First, the government’s commitment to funding them is unclear. World Bank documents indicate that it intends to set aside 10–15 per cent of savings from subsidy cuts for social investments. The IMF staff report states that about 1 per cent of GDP in fiscal savings will be directed to additional food subsidies, cash transfers to the elderly and poor families, and other targeted social programmes. Second, the programmes use a “proxy means test” to identify eligible households within selected districts. Simulations estimate an exclusion error of up to 59 per cent, which is significant. Furthermore, weak governance leaves the programmes vulnerable to abuse and manipulation. And most fundamentally, the scale of the programmes is too limited; they aim to cover about 1.5 million households by 2019; this represents about 40 per cent of the poor, meaning the remaining 60 per cent will be left to face the impact of rising living costs without support. The Fund’s apparent lack of attention to sequencing reform measures is leading to adverse effects on the overall performance of the economy, as well as the status of economic and social rights. For example, subsidy removals have been expedited before the Egyptian government has built up the technical capacity to properly implement social protection programmes that target the poor. In the absence of an adequate social safety net, the living standards of the millions of Egyptian households already living in poverty are likely to drop even further, while a huge number of middle class households will be at risk of falling into poverty. All of this is happening in a context of huge corruption scandals and an expanding military industrial complex that distorts the market. For example, the military receives unchecked economic incentives, one of which is a VAT exemption. In January, the military received a licence to form a pharmaceutical company. Although the IMF agreement makes a rhetorical commitment to enhancing accountability and combating corruption, the clear priority is “to create a competitive business environment”. It has tacitly endorsed reforms that will exacerbate corruption and praised the government for settling investor disputes, many of which have involved allegations of malfeasance. It is also occurring against a backdrop of ever increasing restrictions on civil society space and freedom of expression and association. The Egyptian government has responded harshly to critiques of its economic reform plan. For example, in early December, Mona Mina, Secretary General of the Doctors’ Syndicate, was accused of spreading false news for comments concerning the availability of medical supplies in hospitals. In November 2016, it was reported that two women were arrested in a subway station for discussing hikes in prices. More systematically, the government is attempting to silence independent analysis of the impacts of its economic reforms. Parliament recently passed a new law regulating civil society organizations, which the UN Special Rapporteur on the rights to freedom of peaceful assembly and association warned “threatens to devastate” independent civil society in the country for a long time to come. There are a number of alternative policy choices the Egyptian government can make with the support of the IMF to help address the country’s economic crisis, alternatives that would avoid this huge social cost, and meet its international human rights obligations and that would offer a blueprint for a fair and equitable economic model, as has been affirmed by various UN bodies in recent years. For example, in 2013, the Committee on Economic, Social and Cultural Rights called on the Egyptian government to ensure its obligations under international human rights law be taken into account in negotiations with international financial institutions and provided detailed recommendations to fight poverty, improve employment conditions, and increase both the minimum wage and spending on education, healthcare and social protection. 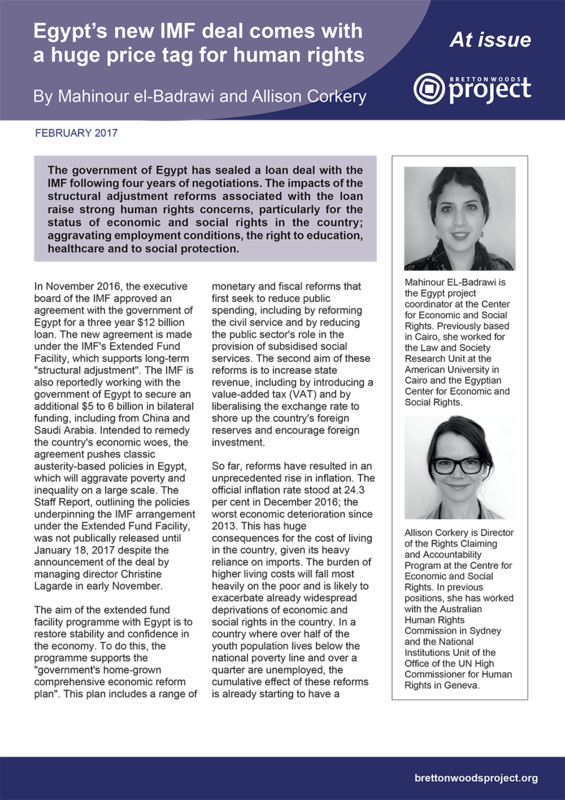 These recommendations were echoed by the Human Rights Council in 2014 during its Universal Periodic Review of Egypt. Actions to implement these recommendations could include public efforts to reform and revive the productive capacity of the state, so as to provide the foundation for a development model based on decent work and fair wages. A human rights approach to subsidy reform can also guide the government towards building a social protection model that would effectively contribute to the eradication of extreme poverty. Egypt’s tax collection capacity is ranked at 151 out of 189 in the Doing Business report, down five points from last year. This suggests that it could raise revenue more fairly by strengthening the capacities of the state tax authority and pursuing more progressive tax reform. Combating illicit financial flows should be another priority, having cost the country $13.8 billion between 2011 and 2013. A critical first step in opening up the possibility of alternative avenues is addressing the uncertainty and lack of transparency surrounding the IMF deal. Opening channels for meaningful civil society participation in designing an economic reform plan that enjoys public support is likewise essential to deliver sustainable development for the country and its people. In response to this article, CESR received comments from the International Monetary Fund’s Mission Chief for Egypt, Mr Chris Jarvis, which are available below at the Fund's request. The response reiterates the Fund’s position on the adoption of a Value Added Tax, reforms to subsidies, and the expansion of social protection programmes in Egypt. Yet it also confirms certain concerns expressed in the article – namely that the reform agenda reflects a narrow view of macro-economic stability and that the social costs of the reforms have not been adequately assessed or addressed. In reply, CESR nevertheless welcomed the Fund’s openness to discussion and expressed interest in further substantive engagement around the human rights consequences of Egypt’s IMF-supported program.